Update: pictures on the flood situation 15Nov2011 here. Take a bag walk in a large circle and the bag is filled as you pass different stations. Give it to the a group of 30 people sitting and tying the bags up. Then a human chain laods about 100 bags into one of the HUGE trucks. Load 40 kg bags of rice into a trucks from forklift pallets. Two man job. I insist its always two men, no heroics, the young ones will try anyway though. Finally some REAL action and heavy lifting. I've not seen any real action on the flood relief front - because as a foreigner I wasn't able to find it till now. It's a'happenin' though, and with real gusto. About 10 huge trucks needed filling, 130 volunteers mill around the Thai Red Cross. Students, tiny petite girls, lanky tall dudes, weatherbeaten veterans, the whole mix is here. Even a farang (foreigner) or two. There is a spirit of adventure and all joining in, everyone just looks for stuff to do and does it. I only speak a little Thai, but the organization is kind of organic.It's easyto pick up. Monkey see, monkey do, stuff. Ok, now we do the bag fill run again. Then the human chain to fill the truck with water, with boxes, with bags. The 40kg bags or rice are out of their league. "Da Boiyz" do those. "Two at a time", "Song Khon" I tell them in Thai. It's about the only thing I input into the process and they listen. Still surprises me that people listen to me. Then a young Thai explains it to me. "It's because your old, they'll listen to you." Ouch... there I have it !!! I now have the seniority of age, I finally made it to that level. I have felt things were kinda easier, people listened to me recently, esp in Asia. Get older in Asia, seems a wise choice. A thoroughly enjoyable day, real action, witnessed first hand. And I didn't get any funny stares or looks. Just turned up, did it. I wonder about the process in Australia, I can just imagine it. Kilometers of forms, insurance, legal stuff to sign. Here you just wander in and help. Today I've found my balance in work: the recipe is: mental work for half the day, and physical work for the other half. Perfect. Why is something like that so enjoyable ? And working in a large bureaucracy/organization is so deadening ? Too tired to do much more now. My stomach gives up sometime during the night as I am camping during the season’s first frost and I lose track exactly how many times I have hurled. When the sun comes up in the morning, I pack up and decide to pedal into the closest town to look for a pharmacy or a place to die, whichever comes first. you eat it raw, no fluid, or as little as possible. The oats/chaff/dry stuff expands in your stomach, and moves down the system like a "SOAK IT ALL UP" plug. 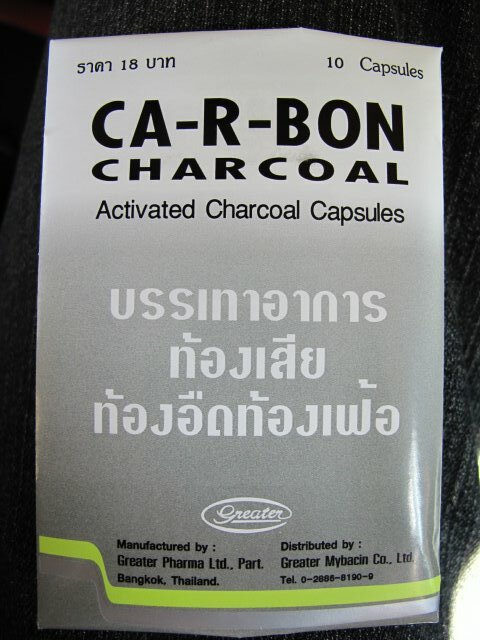 In Thailand they have carbon tablets to do a similar job. PS: the reason it works when pills and chemicals won't is that it's purely mechanical, you effectively create a big sponge that soaks up all the crud and moves it down and out. With pills you have to get the right ones. If you get the right ones all is fine. But if you get pills for Amoeba's and you have the 'other' variety of bug, they won't help and vice versa. The Plunger works on anything. If it doesn't - time to call it quits. the HUGE brass Gong fills the whole space around me. the air shimmers and booms with shifting harmonies. The hot tropic air is cool up here, the Golden Mount, the highest natural point in Bangkok. Thousands upon thousands of people shuffle up centimeter by centimeter, bodies against bodies, hot, human mass of bodies winding its way up and around in a huge spiral. I'm at the very top now. something dislodges in me, the deep vibrating sounds loosens something in me. All around is the vast sea of lights of Bangkok. Fireworks going off in the distance. its in me and around me and through me. Why do I feel like crying ? Who cares, no one would notice and if they did they'd not think it strange. People kneel in prayer around the most central stupa, - today and only tonight, it is clothed in read cloth, illuminated by bright lights, it shines like a lighthouse for tense of kilometers. The smell of cooking, drifts up, the sounds of the fair far off. Everywhere, shuffle, shuffle, shuffle, but up here, it's cool and there is space to walk, on the roof of Bangkok. I kneel down, take off shoes, pray. First issue..... oh... I know what to do.... hm... how come I suddenly just knew what to do ? Great. Second issue.... I get a picture... about the situation, it describes it and I see what the best path would be... its a clear image, for the next 3-to-4 years ahead. Third issues..... Yes, that will happen. No problem, it's ok.
Relieved I get up. Something happened, no idea how or why, but I feel different. And then the long way down, it's much faster. The path to the road takes 30 minutes, shuffle, body to body, touching on 4 or 5 sides, squeezy, slow, smoke from the grills on the side drift over us. But I don't mind, I knew this was the deal. I knew I HAD to go to the very top tonight. And that would be the price, I knew that. I've visited Thailand since 1978, and today was the first time I'd ever gone up the Golden Mount. The couple who run the Passport bookshop told me about Loy Kratong there today. Sunday 6th Nov, I joined a group of farangs and Thais to raise money for the flood victims. We offered to wash windscreens at intersections around Bangkok. tomorrow I"m going to visit their HQ and ask about helping with the flood appeal. I might be delaying my trip to Laos a little. videos of windscreen washing in BKK. - click on pictures for full readable size.